Kasaragod is a beautiful town poised at the Northern extreme of Kerala State.16 km south of the town on the National Highway, is the largest and best preserved fort in the whole of Kerala, bordered by a splendid beach. 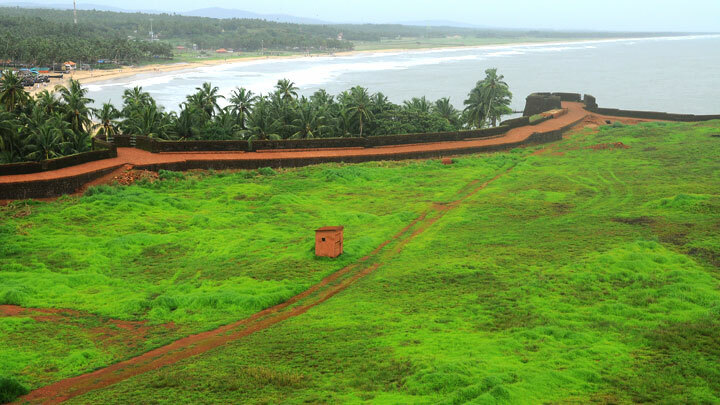 Shaped like a giant keyhole, the historic Bekal Fort- built in 17th century – offers a superb view of the Arabian Sea from its tall observation towers, which were occupied by huge cannons, couple of centuries ago. Near the fort is an old mosque said to have been built by the valiant Tipu Sultan of Mysore. Built by the rulers of the ancient Kadampa dynasty, the fort changed hands over the years to the Kolathiri Rajas, the Vijayanagar Empire, Tipu Sultan and finally, the British East India Company. Today, the Bekal Fort and its surroundings are fast becoming an international tourist destination and a favourite shooting locale for film makers. Nearest airport: Mangalore, about 50 km from Kasaragod town; Calicut International Airport, Kozhikode, about 200 km from Kasaragod.